A friend game me some thread so I gave him a bloom kusudama, 4 petals version, with a tassel made from those same threads. 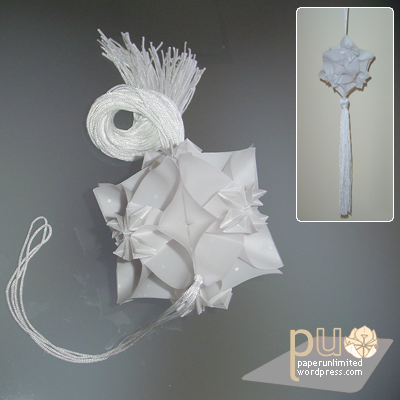 The kusudama was made with a kind of sketch paper with some glitter for making origami. Ok, I use that kind of paper (with no glitter, of course) for sketches and technical architectural drawings and right now I really don’t remember the english name… In here it is often referred as architect or engineer’s paper. This entry was posted on 2007|06|26 at 20:06 and is filed under kusudama (glued), modular origami, rumblings. You can follow any responses to this entry through the RSS 2.0 feed. You can leave a response, or trackback from your own site. Sketch paper= vellum. Or maybe it is glassine. I like your origami work. Do you have instructions for make your tassels? These tassels are a bit different from others i been found. Hello, i loved it. I love your creations. Do you have instructions to do it? Could you share it with me?